While everyone right now is more interested in whether or not Idris Elba is going to be the next James Bond, there are others who are more intrigued by his latest film Yardie. After all, this isn’t just any old vehicle for the actor; it’s his directorial debut, and people are curious about how Elba can fare when behind the camera, because he’s already proven he’s got a lot of talent when in front of it. Luckily, as a director, Elba handles everything perfectly well. It’s a solid debut that’s neatly paced, competently shot, with a consistent tone that’s alternately suspenseful and dramatic when it needs to be, and holds your attention just enough to be curious about what’s going to happen next. The thing is, however, he’s working with a script that doesn’t flow as well, one that juggles several ideas at once and often comes extremely close to letting everything fall aimlessly to the floor. Based on Victor Headley’s cult book of the same name, the film opens up in 70s Jamaica where a young man named D (Aml Ameen) works for Kingston crime boss King Fox (Sheldon Shepherd), who took him under his wing after his older brother Jerry Dean (Everaldo Creary) was shot and killed at a peace concert. D is sent on an assignment to London, to deliver a bag of cocaine to drug-addled crime boss Rico (Stephen Graham, who bizarrely tends to switch from a Jamaican accent to a Cockney London one every now and then) in a mission that soon goes south, and soon D finds himself reuniting with his old flame Yvonne (Shantol Jackson) and their young daughter who he’s not seen since infancy. However, before D can finally settle into a life away from his criminal past, he must first right the wrongs that plague his mind, including finding and hunting down the man that killed his brother all those years ago. I’m honestly amazed that I was able to pick up this much about the plot, because this is a movie that can be pretty difficult to understand, but that’s not necessarily the fault of the movie. A large percentage of the dialogue is spoken in the Jamaican dialect, which as you will probably know is a very particular way of speaking, and to the untrained ear can be quite incomprehensible unless you’re really trying to pay attention like I was. Unfortunately, there were times when people were talking and I honestly had no idea what they were saying half the time, and as such there were plot developments happening on-screen that I had no idea about how they led up to that point, because the characters were mostly talking in a way that I personally couldn’t follow all that well. Maybe I just don’t have as high an understanding of the Jamaican dialect, or maybe I really am that stupid, but it honestly was difficult for me to follow along with most of the dialogue and large chunks of the story primarily because of the decision on its language; but I want to reiterate, this is not a flaw with the movie itself, it’s just a personal problem that I had with understanding this way of speaking. What I did understand, however, was that Elba clearly had a vision in mind for this film, and muddled script aside – though I feel it’s important to clarify that Elba didn’t write said script; the credited writers are Brock Norman Brock and Martin Stellman – he really brings a sense of cultural appreciation to certain scenes, from the heavy reggae soundtrack to blaring DJ sets (which, given Elba also acts as a DJ himself on occasion, isn’t that surprising to see here), which act as a love letter of sorts to the kinds of music that Elba grew up with and clearly influenced him later in life. He also has found a strong and capable lead actor in Aml Ameen, who oozes charisma in each of his scenes and makes his character a relatively easy one to root for, thanks to his natural ability to charm virtually anyone he shares a scene with, as well as the audience watching him do all these things. However, Elba does on occasion fall victim to the usual “first-time director” trappings, such as an unnecessary and expository voiceover narration that lays out emotions and certain plot developments that we as an audience would have more than likely picked up on without having them explaining it to us, and a supernatural theme which sees the ghost of D’s older brother literally come in every now and then to haunt his memory. How much of that was Elba’s addition, or whether it was already in Brock and Stellman’s script, I’m not entirely certain but whoever did probably had no idea how to reign in the symbolism and just let the movie speak for itself. Other than those minor pitfalls, Elba proves himself to be a perfectly competent filmmaker, and Yardie is a fine starting point for him to go on to grander projects as a director. It’s a slight shame, then, that the script he’s working with here isn’t nearly as smooth. Alternating from generic London gangster thriller to emotion-driven revenge story, Brock and Stellman’s script doesn’t offer much in terms of strong plotting as it meanders from one idea to another without much segue, and certain characters and sub-plots end up getting lost in the mix as there’s so much other stuff going on right in front of them that it’s easy to forget they even exist. 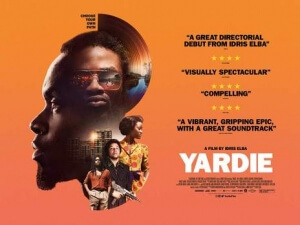 If the script had just a bit more focus, and didn’t try to throw everything in its arsenal at the audience, then perhaps Yardie would have been a much stronger movie. Instead, it marks a mostly solid directorial debut for Idris Elba, but is otherwise not something he’s likely going to be later remembered for. Yardie is a mostly solid directorial debut for Idris Elba, who brings a good sense of cultural appreciation as well as a capable lead performance by Aml Ameen to the mix, but is let down by a script that criminally lacks focus.